Tap on photo background and photo foreground, choose picture which you want to blend. 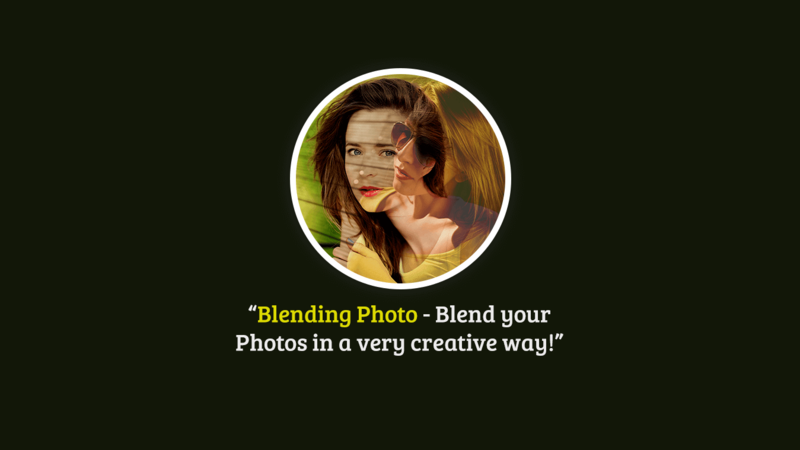 Click on Blend option in the toolbar and adjust your pictures. You can easily adjust your picture with the options of Rotate Right, Rotate Left, Vertical, Horizontal, Fill, inside are available in the tool bar. Crop you Pic and Apply Backgrounds! Make your picture look more beautiful by applying colorful background. Just need to tap on background button, select your favorite color background and apply it! You can easily crop your picture using crop option available in the toolbar. Go to filters and edit your picture in many ways like you can Add Brightness, Warmth, Contrast, Tint, Blur and much more. Edit your picture with multiple effects like Light, Frames, Stickers, Add Cute and Funny Stickers on your picture. Write and Express yourself with multi color text and different font styles of features. Want to blend pictures with collage. Go back to main page, tap on blend with image, choose your collage, add pictures. Save your beautiful blended image in your device gallery.